The indicator shows the trend in quantities of total ammonia (NH3) emissions in Slovenia. The quantities of emissions are calculated in accordance with the methodology for creating the National Emission Inventory, based on the CORINAIR methodology. The emissions are shown in a time series from 1990 to 2003. 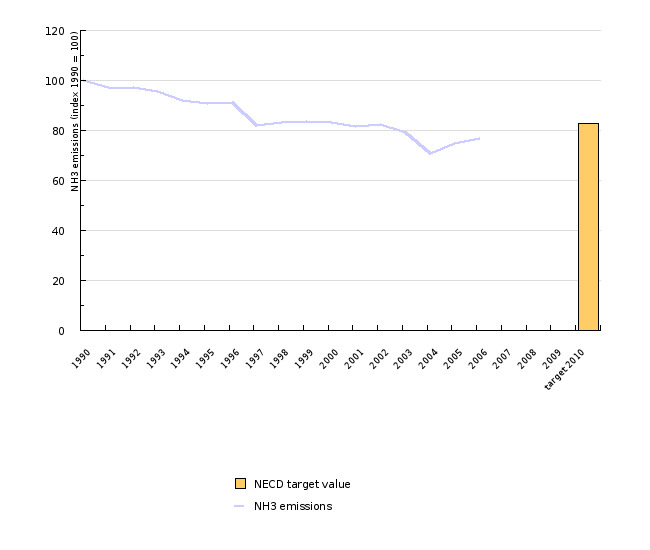 Reduction in NH3 emissions to the target value 20000 is required by the Protocol on the Reduction of Acidification, Eutrophication and Ground Ozone, and Directive 2001/81/EC on National Emissions Ceilings for Certain Atmospheric Pollutants (NECD). Air emission management and reduction is also a target of the National Environmental Action Programme. Most NH3 emissions are from agricultural production, but since 2000 considerable NH3 emissions has been produced in transport with motor vehicles equiped with cathalytic converters - and they are growing. Between 1990 and 2003, overall NH3 emissions dropped by 20%. This reduction may be attributed to the decrease in the number of livestock units. 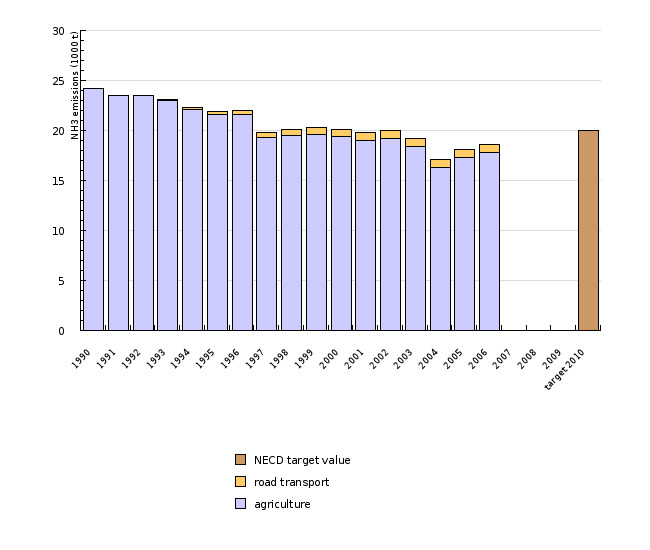 In 2003, NH3 emissions were 4 percentage points lower than the envisaged target path leading to the target emission value for Slovenia (20 000).